Home | Uncategorized | #ReconstructingEurope – Resilience, passivity or joint efforts? 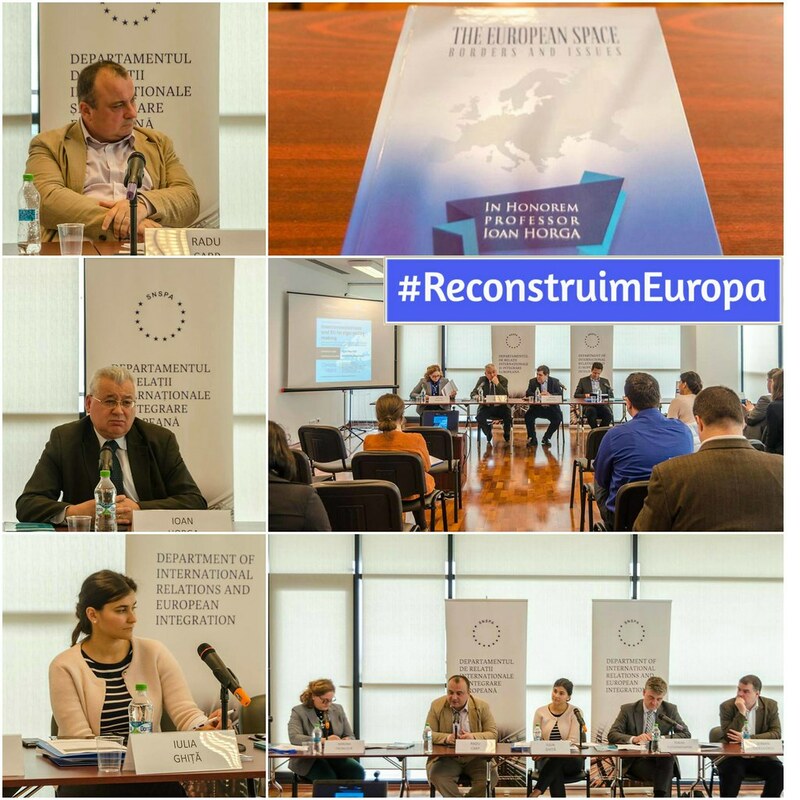 Renown experts from Romania and abroad, together with the members of the academic community of the Department of International Relations and European Integration (DRIIE) within SNSPA Bucharest (teachers, assistants, researchers, students and graduates) have participated between the 8th-11th of May 2017 series of interactive events #ReconstructingEurope. The series of events comprised 4 days of intense round tables, book launching events, interactive debates and international conferences focused on the most relevant European topics on the current global agenda. The debates were marked by the concept of “inter-connectivity”, which we wanted to illustrate in all our events by working together with several partner institutions, governmental, non-governmental and interdisciplinary perspectives, and by linking the local, regional and national dimensions with the European issues discussed. Our reflection platform brought together in the academic world various perspectives on current European issues and their impact on Romania, on the role of the EU in the international scene in the post-Brexit era, on the principle of resilience in EU foreign policy, on the difficulties of European integration of the Western Balkans and on the security evolutions in the Black Sea area. 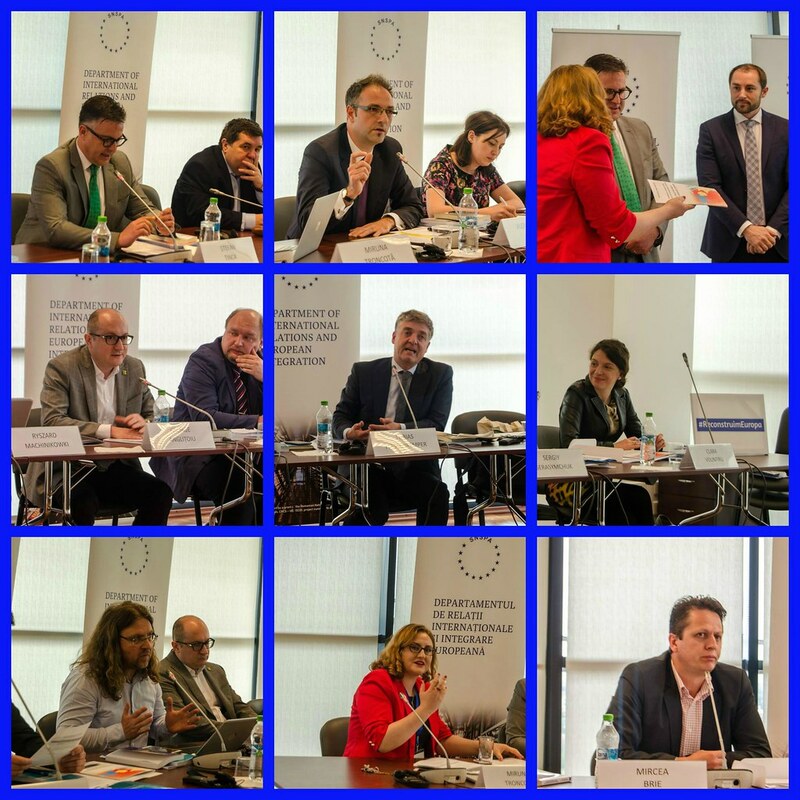 The events benefited from a wide participation and diverse audience, that brought together members of the diplomatic corps of Bucharest, journalists, students, experts from Romanian and international think tanks. Our guests discussed with teachers and researchers from other specializations from SNSPA, the SNSPA Doctoral School, professors and researchers from the University of Bucharest, from the Academy of Economic Studies, University of Oradea, as well as representatives of the European Commission and the Ministry of Foreign Affairs. The series of events started on the 8th of May with a debate with top specialists from Romania and abroad on the subject of Romania’s ‘troubled neighborhoods’, caught between the conflict in Ukraine and the instability in the Western Balkans, in the context of the ever more pressing need for Bucharest’s strategic recalibration and preparation for Romania’s Presidency of the European Union Council from 2019. The DRIIE events were opened by Prof. Univ. Dr. Iordan BĂRBULESCU, Dean of the Department of International Relations and European Integration of SNSPA, who spoke about our intention to review the latest developments within the EU, to critically reflect on the dynamics that affect directly and indirectly the Union’s borders and external relations. He stressed out that the professors and students, along with our partners, want to contribute through the #ReconstructingEurope series of events to the global debates of the moment about the future of Europe. He also mentioned that the intention of DRIIE for contributing in this series of events was to outline a set of suggestions on setting up Romania’s strategy for the Presidency of the European Union Council of 2019. The special guest of the event, Ambassador Stefan TINCA, Director of the Political Directorate of the Ministry of Foreign Affairs, emphasized in his speech the importance of Romania’s focus on the developments in the neighborhood and its support for the democratic reforms in the Balkans and the Eastern Partnership states, based on the experience and the lessons learned in the 10 years since its accession to the European Union. The discussion was followed by the launch of the most recent Political Paper entitled “Romania’s Concentric Circles” in the Line of Fire “The Impact of Hybrid Actions and a Possible” Ukrainian Scenario “in the Balkans” edited by Dr. Vasile ROTARU and Dr. Miruna TRONCOTĂ, DRIIE postdoctoral researchers, and with the contribution of Ionela CIOLAN (SNSPA) and Maria Magureanu (University of Bucharest). The analysis has brought together the results of the research project entitled “A new Cold War in Europe? How does Russia (re-) interpret the Balkan experience in order to challenge the European order”, PN-II-TE-2014-4-0534, Young Teams “, offered by UEFISCDI, Ministry of National Education. The first 3 days were marked by a pronounced interdisciplinary character, building on research projects conducted by DRIIE experts and by bringing together expertise from the Jean Monnet Centers of Excellence co-funded by the European Commission through the Erasmus + program: “In and Out: Understanding the European Union beyond its borders “(8th of May) and” Structures of Interconnectivity in the EU Neighborhood “(9th-10th of May). Foreign experts also contributed significantly to the extent of the discussions: Tobias FLESSENKEMPER, Senior Fellow & Balkan Project Director, Centre International de Formation Européenne (CIFE), Nice (France), Dr. Ryszard MACHINIKOWKI, University of Lodz (Poland), Sergiy GERASYMCHUK, Ukrainian Prism, Foreign Policy Council, Kiev (Ukraine), Cristian Barbieri (Istituto Affari Internazionali, Rome, Italy), Cino Luigi (Scuola Superiore Sant’Anna, Pisa, Italy), Daniela Bacheş, (Brunel University, Great Britain), Călin Neacsu (Agence France Press AFP, Balkans), Aida Sosic (Bosnia Herzegovina). They expressed their ideas with reference to the new EU role on the global scene, marked by the crisis in Ukraine, the ongoing war in Syria, Brexit, which made integration of security and defense in Europe a real necessity. The main aim of the May 9-10 conference was an academic one, bringing together young researchers from Romania and abroad to analyze from a new perspective the European Union’s foreign policy in the context of the interconnectivity phenomenon found in the European Union Global Strategy supported by the High Representative, Federica Mogherini. For two days, experts and participants explored the role and resources of the European Union in managing crisis situations, from its emergence as an actor in the Balkans, until recently, in the aftermath of the conflict in Ukraine. The roundtables of experts, the two workshops focused on social sciences methodologies for PhD students and group debates, have contributed and facilitated the collaboration between academia, public institutions, professional groups and representatives of civil society (particularly the debate workshop organized by the Romanian Association of Oratory and Rhetoric ARDOR Muntenia) to enrich the knowledge on this subject. 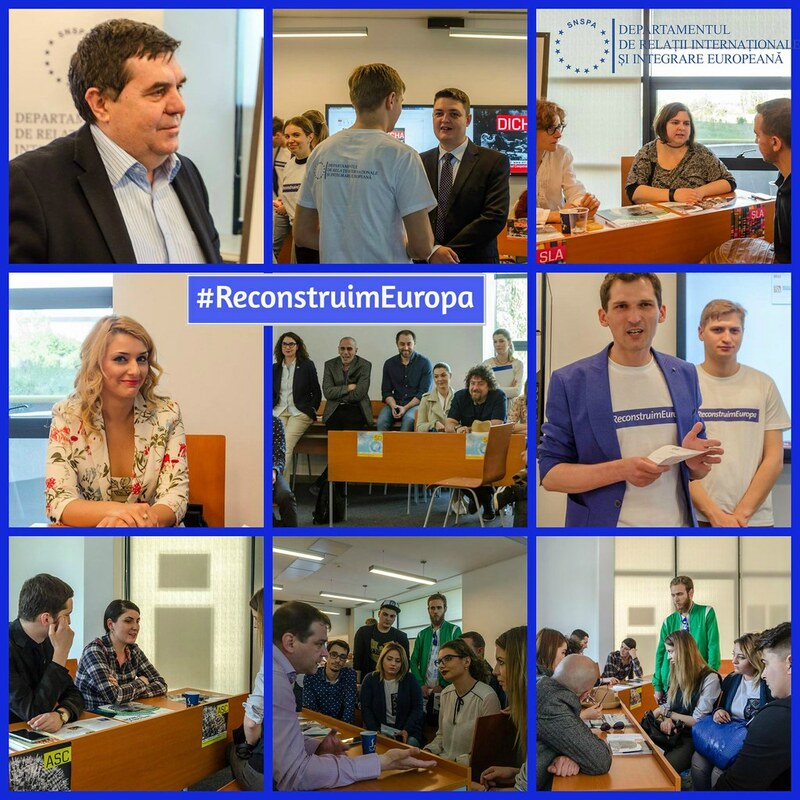 On the 11th of May, the #ReconstructingEurope series of events approached non-formal methods to actively include students, master students, DRIIE alumni and all those interested in contemporary international relations issues. On this day, we inaugurated the lobby of the fourth floor of DRIIE with a photo exhibition “In or Out? #ReconstructingEurope beyond the borders” incorporating a selection of images by which we challenge viewers to reflect on the question – “Where does Europe start and end? And what does it really mean to be inside or outside Europe?” We included in the exhibition the creative contribution of a 1st year MA student from DRIIE – Cosmina Moghior, a selection of poetic and vibrant images from her travels through Europe and the Balkans during the Erasmus scholarship. The exhibition remains open all month and we invite you to explore it in the coming days. With the help of our sponsors – International Student Identity Card (ISIC), the European Commission Representation in Romania, the European Film Festival (Romanian Cultural Institute), the Ilfov Regio Development Agency, the Europe Direct Center, the Tritonic, Humanitas, Military, and Corint Publishing Houses – we awarded the prizes for “Let’s #RebuildEurope together!” contest, essay and photo sections. Also on the 11th of May we launched the DRIIE Alumni Club – a network of expertise and career mentoring of the DRIIE graduates, attended by Drs. Denisa Meiroşu, Anamaria Chiş, Drd. Ionela Ciolan, Drd. Sebastian Blidaru. The evening continued with an interactive presentation of DRIIE MA Programs using the “Living Library” method (for all those interested in the admission to DRIIE MA Programs for 2017), and ended with the film projection of “The Siege” (last day of the European Film Festival in Bucharest, 21st edition) and the debate “#ReconstructingEurope from Sarajevo?” organized by DRIIE in collaboration with PEN International Writers’ Organization, PEN Club Romania Branch. 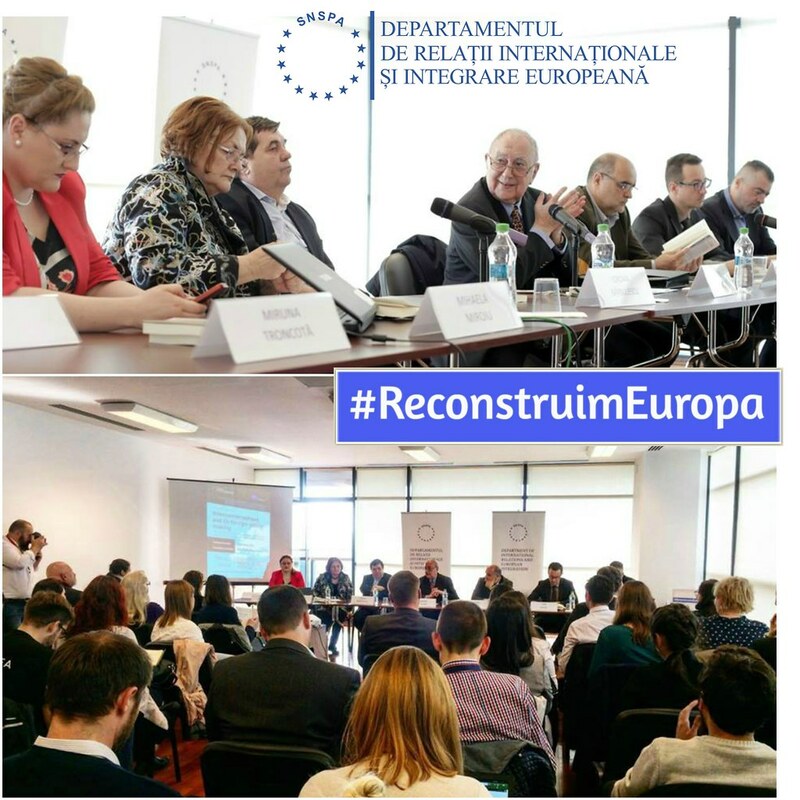 Finally, we note that one of the main conclusions of our events is that Europe’s reconstruction projects can support different scenarios and trajectories that can focus on the concept of resilience launched in Brussels, but can also be marked by opposite trends such as passivity and/or resistance to change. Europe’s reconstruction, however, is a medium and long-term project and offers the opportunity for new generations to convert these negative trends into joint effort and European solidarity. 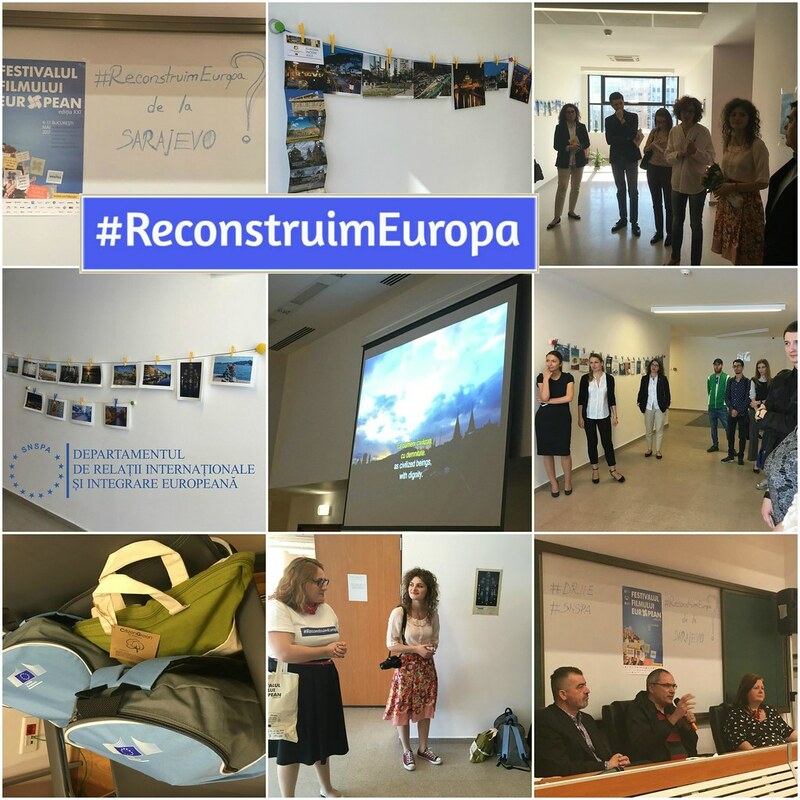 The contribution of the DRIIE academic community on this topic was open, consistent, applied, argued, where the expertise on these relevant themes included voices from the academia, decision-making, non-governmental, and artistic cultural dimensions in the #ReconstructingEurope series of events. 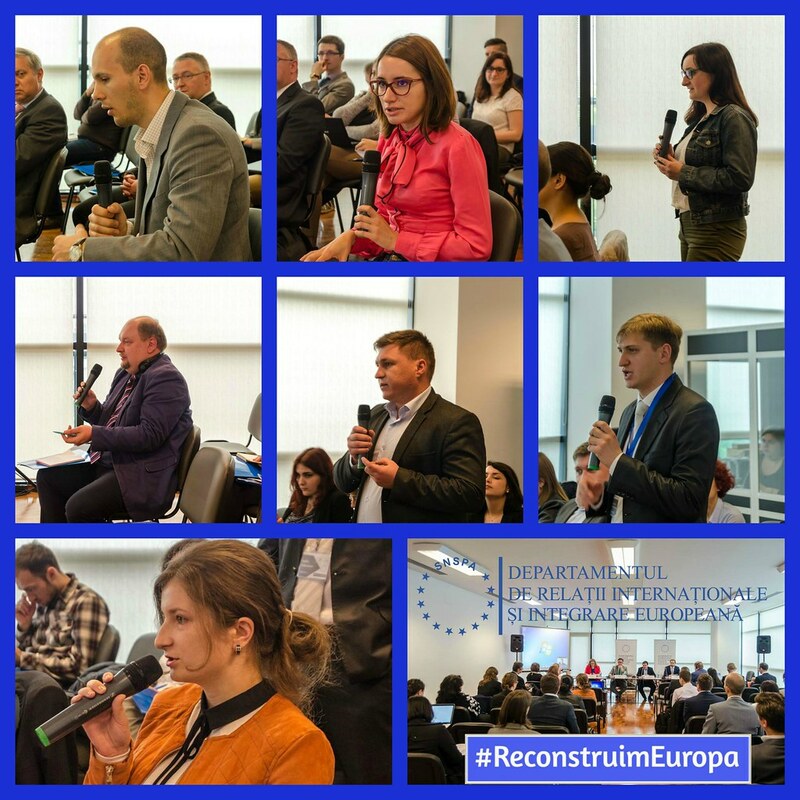 We are particularly grateful to our media partners ISIC.ro, Europunkt.ro, Intervio.ro who contributed significantly to the events and to the entire team of volunteers and DRIIE collaborators that made possible the #ReconstructingEurope series of events! Follow us on Facebook: Evenimentele DRIIE to keep track of our other 3 events that we organize by the end of May.